I was asked recently to write a blog about sponsors going to visit their child. The request was a simple one; create a to do list of what to do before you visit the child you sponsor. Something like “10 Things To Do Before You Visit the Child You Sponsor”. Another option was “Ideas for Fundraising for a Sponsor Trip”. Nothing wrong with those ideas. People need practicality. We all need lists and ideas to help us get to where we need to be. And try as I might, I could not muster up the creative juices to start. I have been on multiple tours with Compassion over the past 12 years. I could certainly help to prepare you for international travel and the rigors of living in a foreign environment. I could warn you about not drinking the water or how you may experience “culture shock”. I could list things to pack and even tell you some things to leave at home. I answer questions for sponsors nearly every day of the week. But my soul just wouldn’t get excited about writing out a list or offering tips on how you could raise funds to visit your child. In fact, I’m terrible at fund-raising. Not my favorite thing to do, so maybe someone else will take that one on. No, I can think of so many other reasons to visit your little girl or boy. I see it on every trip I take. I see the tears, I hear the joy and I sense the change. I will try and provide you with a list of things to do before you visit your child, but it will have nothing to do with getting your immunizations or securing your malaria pills. I won’t be listing the travel items that are so important to your comfort and wellbeing. No tips about contacting your bank before you leave home or making sure you have the proper electrical adapter. Is to fall on your knees. Fall on your face. You may be asking what does this have to do with visiting my child? The short answer, everything. 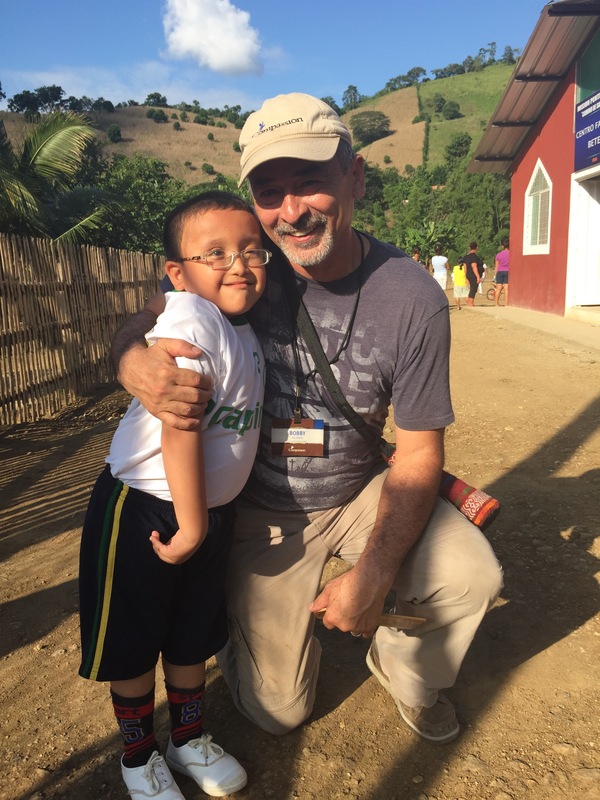 You may be thinking that your visit to your sponsored child will be an enormous blessing to him or her. And you would be right. But those blessings work both ways. I’ve seen it time after time. Sponsors tell me on every trip, and I mean every trip, how they didn’t expect to have their lives impacted in such a powerful way. They assumed that they were coming to bless a child, provide them some encouragement, give them a suitcase full of gifts. Leave the child and his family with rich experiences. What they aren’t prepared for is the riches that they will be carrying home. So why should you fall on your knees and fall on your face? To be prepared. Prepared to have your heart broken, to have it cracked wide open. You need to be prepared for your life to change. Many of the things that are important to you today will mean very little upon your return. You need to have your heart ready to be wrecked. Pray. Pray without ceasing. Pray for your child and their family. Pray for the staff at the student centers. Pray for the other members in your group. Pray for yourself. Pray that your heart will be expanded to receive all that God has in store for you. Pray that you would be sensitive to the Holy Spirit as He leads. Pray that you will be ready for the tears that will surely come. Pray that you will let them come, unashamedly and without restraint. Pray that your smile will send a message to your child of what the face of the Lord must look like. Pray that the message your child hears is not only “Here I Am” but here I am and I bear His image. I bring Him to you and you bring Him to me. It’s a short to do list but it’s long on meaning. I hope I see you on one of my trips. And if I do, I hope I get to hear you tell me how you prayed and you still weren’t quite ready for how your heart has changed. I hope I get to see your tears. I promise I will bring plenty of tissue and a soft shoulder to cry on. Have you ever had one of those days when you felt like God was trying to get your attention? I had a day like that recently. The message was loud and clear, and it came from a variety of sources. It was my second trip to Ecuador in two months. I asked myself more than once, what the purpose was, for me to be on this trip. I knew the basic reasons; I was there in the event of an emergency, I was there as a liaison between the Ecuador staff and the American guests. I was there to promote Compassion International. But there had to be a bigger reason to send me all this way a second time in less than two months. I found my reason in the face of a little boy named Bryan. Bryan was one of the overlooked. And I think I noticed him partly because for the first time in a very long time, I was overlooked. As a leader, I had grown accustomed to doing most of the speaking, making most of the decisions. This trip was different. The decisions were being made by the senior Pastor. Pastor Donnie was the one that was being asked to speak. It was him that the team looked to for direction. It was him that the churches wanted to hear from. And that is exactly as it should have been. This was his church, members from his congregation; it was natural for them to look to him for direction. He is their shepherd and I was an outsider to this flock. Don’t get me wrong! What I am trying to explain is a very natural scenario. This is what I expected. What I didn’t expect, is that sting of feeling overlooked, of feeling unnecessary. I made myself useful in many ways behind the scenes, but I could not shake that sense of not being needed. And that may be exactly what God wanted me to feel. I connected with Bryan immediately, it was as if I was drawn to him, and he was drawn to me. I leaned down to say hello to him and ask him his name. It was quickly apparent that he could not speak. He had no voice, only a quiet grunt issued forth. A tutor from the Student Center told me that his name was Bryan and that he could not talk but he could understand me. How could we communicate if he could not talk and I couldn’t speak his language? How would he understand? Bryan couldn’t understand a word I said, and I didn’t say much; but he did understand my smile, my embrace. He understood kindness. We spent that first day with a handful of children and parents from the area. 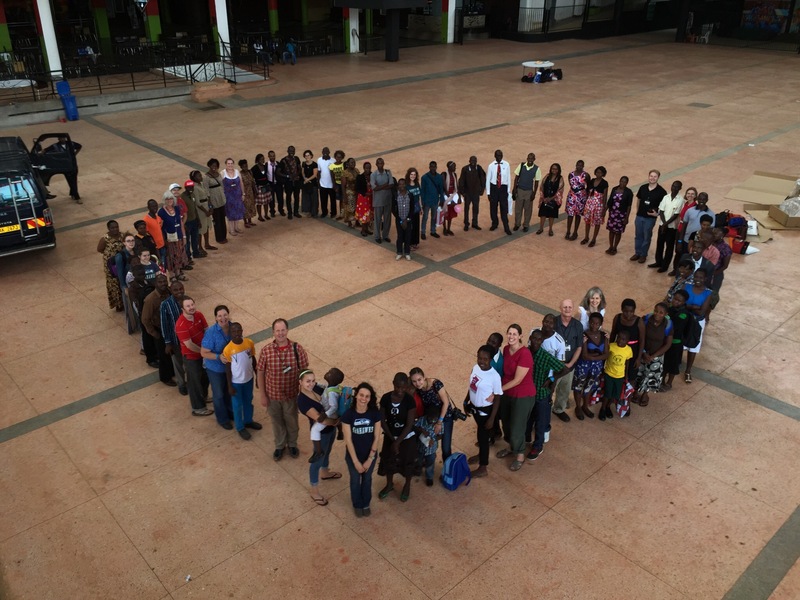 This first visit was to expose the American guests to Compassion’s Child Survival Program. Moms and babies were there to greet us and show us everything they were learning at the center. Their pride was evident, their enthusiasm was infectious. We loved on the moms, and we loved on the babies, and I loved on little Bryan. It wasn’t much, just a hug now and then and a smile when he would run near me. The group split up and we visited the homes of some of the moms from the project. We were gone for about an hour and returned to the center for lunch. When we returned, Bryan was there to greet me. I wished I could tell you that he had a smile on his face, but Bryan’s face was disfigured and he couldn’t smile; his expression never changed, frozen into a twisted mass of nerveless muscle. Nonetheless, he was enthusiastic in his greeting. He would dart in to wherever I was sitting, grab a hug and dart away again; maybe to tell the other children in his own way that he had a new friend. It was during lunch that I think Bryan knew that I accepted him just the way he was. He climbed into my lap as I was finishing my meal and enjoying a cold soda. I took a sip and handed the bottle to Bryan. He took a sip and handed the bottle back to me. This was a moment of decision, and some of you reading this may be shuddering to think what came next. I took the next sip and Bryan seemed satisfied with that. It may not have been his first taste of cola, but I am fairly certain that it was the first time he had shared a cola from the same bottle with a stranger. I couldn’t see it on his face, but Bryan seemed delighted from that point on. He handed the bottle to me once more to make sure that I had had enough. I took one last sip and Bryan dashed away with the bottle of cold soda in hand. I think he wanted everyone else to see that he had something for the first time that no one else had. The afternoon passed quickly with presentations from the project staff and conversations with the Pastor. We left late in the afternoon, hot and tired, ready to get back to the hotel. I thought of Bryan some more that evening, hoping I had shown him the heart of Jesus; wondering if I had done enough. The next day we returned to the same project; physically refreshed and spiritually expectant. I was ready for another day of playing with the kids, interacting with the parents, encouraging the staff. I barely had stepped off the bus when I noticed flailing arms bundled in a red shirt running towards me. It was Bryan. He ran past all the other members of our team and came straight to me. I scooped him up and gave him a hug. The rest of the team declared Bryan as “Bobby’s buddy” the rest of the trip. And Bryan was my buddy for the rest of the day. He never let me out of his sight and I kept an eye on him too. There were many more children at the Student Center today. This was a regular day for them to attend. They were excited, anticipating this visit for many weeks. We were once again greeted with toy horns, the kind people blow annoyingly at birthday parties or New Year’s Eve festivities. Today the sound was far from annoying; it was music to my ears. So much excitement from the children and staff that you would have thought it was New Year’s Eve! Kids running and shouting, looking forward to what their guests may have brought with them all the way from America. Bubbles and balloons and stickers made their way out of backpacks and canvas bags. Wooden cars and trucks lovingly carved by a church member were quickly snatched up. Team members were swarmed by eager hands, grabbing for candies and plastic toys. And I saw Bryan from the corner of my eye, trying to make his way with outstretched hands; reaching for the gifts that the others seemed so excited to receive. He wasn’t as big or as strong as some of the other kids and by the time he made it to the giver, the presents were gone. I found one of the team members who was frantically trying to stay afloat on this sea of kids, and asked if he had anything else to give away. He was more than happy to offload some of his precious cargo. He handed me a package of balloons, the big ones that are attached to a large rubber band and become a punching ball. Off I went to give them away and immediately was swarmed by children and parents. They weren’t even sure what I was giving away but they knew that they wanted one. The balloons were gone as fast I could blow them up, tie them off and demonstrate how to use them. Bryan tried valiantly to make his way to me, to tug on my shirt so I would see him. He didn’t know that I had never taken my eye off of him. The last balloon was being fought over, parents trying to get my attention, the word aqui, aqui (here, here) being shouted from every direction. You already know where the last balloon went, it was saved for Bryan. Bryan ran off with his prize, in sheer delight; at least that is how I imagined him running off. And I felt grateful that I could provide him with this simple pleasure. A few minutes passed by and I felt a tug on my shirt, it was Bryan again; pointing to a large boy that had taken his balloon. I took Bryan over to the boy and in broken Spanish and clumsy hand gestures; I made him give the balloon back. Now before you start thinking about wanting to give the bully a smack; you need to know that he was Bryan’s older brother. And older brother was looking out for him. 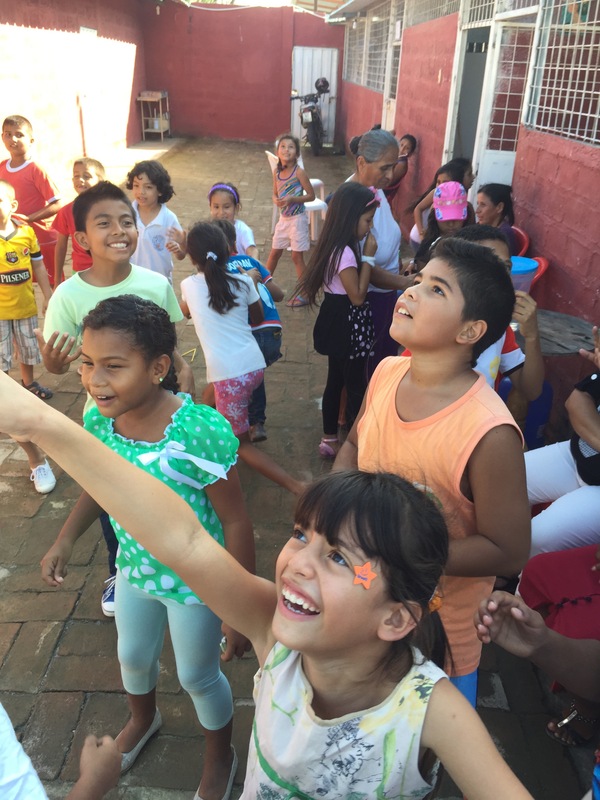 A new round of enthusiasm captured my attention as kids began to shriek with delight, popping bubbles and swarming one of the team members. Round after round of bubbles went into the air with children jumping and swinging their arms to pop them. As I was taking some pictures of these gusts of mirth and glee; I felt a familiar tug on my shirt. There he was again. He couldn’t scream in pleasure like the other kids and he had no other way to get my attention. But he did understand the joy that was being experienced. He did not know that with every tug on my sleeve, was an even bigger tug on my heart! I reached down to Bryan and lifted him higher than any of the other kids. He towered over them now! His little hands and arms began to swing at every bubble that came his way. I was so busy laughing with all of the children that I didn’t see one of those hands swiping at the bubbles; until I felt a smack right across my face! The bubbles stopped for a moment as the bubble blower and I laughed hysterically. Bryan was laughing too, I know he was; we just couldn’t hear it. I felt it though. Our day with the children came to a close; we said our goodbyes and gave final hugs. I held Bryan in my arms a few more times, did my best to tell him that I loved him. The words were barely recognizable but I like to think that Bryan understood. Africa, a few months ago. It’s a bit complicated. It’s a bit touchy. These stories always are, when it’s a story of the heart. I’m not sure I know how to tell any other kind of story. After all, if the story doesn’t penetrate a place in our heart; is it really worth telling? The problem I face is; do I have the ability to tell this story the way it deserves to be told? You can be the judge of that, I suppose. Before I get too far, there is something you must know. This story is about someone in particular and it’s about no one in particular. It’s a story that I have seen play out many times. It’s a story of so many hearts, so many lives that are just asking to be noticed, begging to be noticed. I’ve seen it in countless faces, in many places around the world. I saw it once in the deformed eyes of a little girl in Bali, Indonesia. It took me a while to see it. I had to be taken back for a second look because I was too insensitive the first time to notice. She was sitting alone, distant from the other children. I saw her from the corner of my eye, quiet and reserved, painfully shy. A group of beautiful girls had gathered around me, smiling coyly at me, attracted to my kindness; I think. Perhaps they were drawn to my teasing nature, the funny faces that I made; the perfectly timed winks. She may have been drawn to those smiles too; she was just too used to being alone. She was not one of the popular girls, not one of the girls invited to join in the laughter and the secret language of young girls. So she sat at a distance and pretended that this tall stranger from a distant land didn’t matter to her. She pretended that it didn’t bother her to be left out, to be ignored. I wanted so desperately to draw her in. She would have nothing to do with any coaxing on my part. She would ignore the group of girls that were having so much fun with this amusing foreigner; this man that made silly faces and made the girls shriek in delight when he bent over to kiss them on the cheeks. That is when I noticed her, really saw her for the first time. I hadn’t seen it before, a deformity; a growth around one of her eyes that made her appearance a little scary. The disfigurement had caused her to be shunned, to be set aside and this caused her not to smile. Laughter was a very foreign language to her and her face looked angry, bitter. Maybe this was why the other girls never invited her in, she looked upset and mean. Why would these happy girls invite someone to play with them that seemed so…so unhappy? Time was running out on our visit and people were gathering their backpacks and heading to the bus. I gave a last round of winks, and hugs, and kisses to the little gathering of cuteness that had decided to call me their own for the day. I glanced towards the girl with the deformity but she didn’t look up. I left and didn’t give it another thought. That is until later in the day. We had reached the end of another busy, hectic, activity-filled day; time to head back to the hotel for some rest and dinner. That’s when I heard the conversation with our trip leader and the in-country host. Reluctantly, we agreed to stop at the auditorium where we were told that several projects had come together for an annual time of worship. I will admit that part of me had secretly hoped the leader wouldn’t have caved; I was exhausted. If it had not been for the persistence of our host I would have missed out at a glimpse of my own soul. I had been asking God earlier in the day if there was something wrong with my heart. It was day five or day six of a ten day trip. I had witnessed some of the most horrendous living conditions that I had ever seen. And I was not moved. I was not shaken. I had not shed a tear the entire week. I was slightly alarmed at the callousness of my heart. Had I grown insensitive to the conditions? Was this becoming a job to me, something I did for a living and nothing else? These were the questions that I was taking to Jesus that day. So we entered the auditorium packed with enthusiastic children, and banners, and music. We listened to the children make a joyful noise to the Lord and we watched them as they danced with delight before Him. We made our appearance, said a few quick words of encouragement and were headed out the door. I saw the group of girls I had met earlier in the day. They actually saw me first and got my attention. I walked over and gave them something else to shriek about, a few winks and silly smiles. I leaned over and kissed them again. I turned around and looked at the girls I had left behind a moment ago. They were still smiling and giggling. What was not done? And then I saw her; the girl with the deformity, the girl without a smile. She was sitting directly in front of the girls that I had just said goodbye to. And she was sitting alone. I walked back to the very spot I had been only a few moments before. The girls saw me coming and they waved happily to me as I approached. But I wasn’t coming for them. I walked up to the little girl without a smile and I leaned down, took her face in my hands and looked her right in the eyes. I hugged her tight and I kissed her gently on the cheek. I wasn’t sure then, and I’m not sure now, who needed that moment more; me or the little girl. All I know is at that point, the only thing I could manage is to quietly walk to the back of the bus and weep. We need to flash forward a few years to the present, to the back of another bus, on a dusty road on another continent. This time the girl was American, the country was Uganda. She will remain unnamed because I’m not sure she would want the world to see her just now. There was nothing particularly unusual or remarkable about this girl, at least not at this point. If I had to describe her to you the way I first saw her, I would ask you to imagine a librarian in her early thirties. Picture a girl with her hair tied in a knot at the top of her head, wearing a colorful scarf to cover most of her hair. She’s wearing glasses and very little makeup, if any. She has a good complexion and a nice smile. She’s obviously seen an orthodontist at some point in her life. She is tall, but not overly so. She is not a petite girl, but not a large girl either. We sat next to each other on the back of the bus, along with several others and shared stories. Most of the stories were mine. Everyone at the back of the bus wanted to hear more about my experiences, my travels, my adventures. I tried not to dominate the conversation and asked the others to share about their lives. We were several days in to our trip and we were spending the day at a Compassion project in a remote area somewhere in western Uganda. We had left Kampala and we were traveling to Fort Portal, and this was one of the stops on our itinerary. I had several child packets in my backpack and realized that some of them were for children from this very student center. I found one of our hosts and asked if they could locate either of the girls from my packets. They managed to contact them and within a few hours, both girls had arrived. I immediately introduced myself to them and explained what I needed. I was hopeful that we could find a sponsor for both of them. My intention was to simply take a photo with the girls as they held their packets. I would take the photos home and see if I could generate interest for these girls to get a sponsor. Both of the girls seemed a bit nervous and unsure of what was happening. They certainly had to be confused by all the commotion being created by this large group of mzungu’s (white people). I saw the bewilderment in both girls but my attention was drawn to the taller of the two. I’m not sure what I saw at that moment, only that she had captured my attention. Maybe it was the sadness I saw in her eyes. A sense of hopelessness, a quiet despair. I only remember feeling a sorrow for her, deep down. 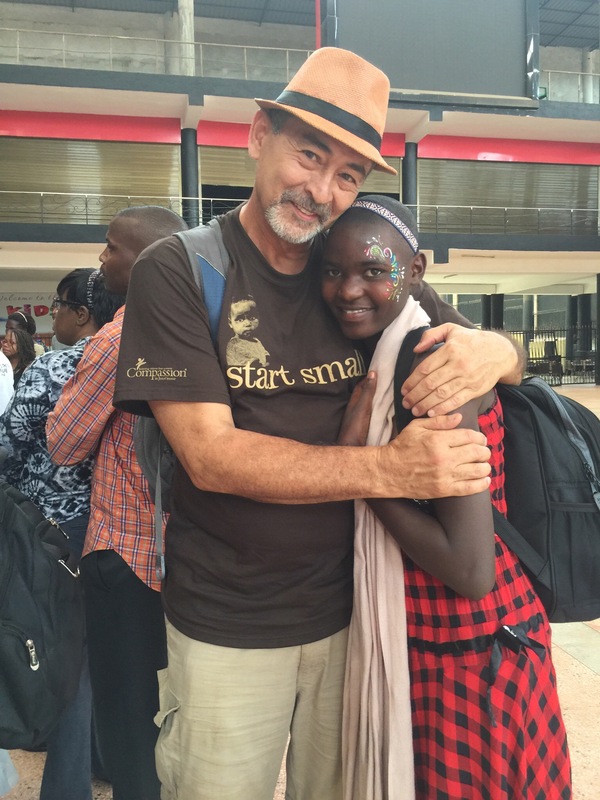 I remember thinking, “I should sponsor this teenage girl, I could make a difference this very minute”. But God had other plans. As all of this was taking place, there were others in the group that had no idea what was happening just a few steps away. It wasn’t insensitivity or a disregard on their part, they were just preoccupied with whatever conversations were happening around them. But the unmindful and the unobservant, suddenly became aware; understanding coming to them in a flash. Another moment or two and the opportunity would have vanished for them. I knew at that moment that God was up to something in the lives of these two girls. First for the girl from the back of the bus, the one who had learned to keep herself in the background; and secondly for the teenage girl from Uganda, another girl that had learned the same lessons, taught to be reserved and reticent. There were timid smiles from the Ugandan girl and humility expressed from the church worker from Texas. There wasn’t a lot of time to get to know one another. A few hugs and a few words of encouragement, some promises that letters would be written and prayers would be spoken. It was time to leave, we were on a schedule. And they said their farewells, the young girl from Texas wishing she had more time, wondering if she had really heard from God; and the teenager from Africa, wondering what it meant to have a sponsor, wondering if she could believe that someone would be praying for her, writing to her. Several days passed and we were quickly approaching the end of our trip. The culmination of our journey was almost here, the day the sponsors were waiting for, the reason they had come at all; the day to visit their sponsored children. And on this special day, our country hosts managed a very special surprise for Deborah and the young woman from the back of the bus. Arrangements had been made for Deborah to join us for the entire day. This may have been the first time that Deborah had ever left her village, it may have been her first time to see Kampala, her first time to ride in a bus. I’m not certain of any of that; what I am certain of, it was the first time in her life that she had been seen. It was the first time that she had really been noticed. I know this because of the transformation that I witnessed from the reserved, shy girl to the one that stood before me now. I know this because of the way that Deborah smiled at me every time our eyes made contact. I know this because of the way she hugged me on that day. It was a look and it was a hug that said thank you for seeing me, thank you for pulling me out of the rubbish and brushing me off. Thank you for seeing something in me that no one had ever seen before. And my heart was full from the smiles of a teenage girl from a small village in Africa, a girl that was dressed in love that day. The girls dressed in love. But there is still more to this story. We cannot forget the girl from the back of the bus, for she too, was dressed in love; her heart being stretched in unimaginable ways. Her heart was given to a teenage girl that day, of that there is no doubt, but something else was happening in the center of her being. And on this particular day, so many things were happening on the inside of a then thirty year old girl…many things she was trying to process and reconcile and make sense of. She was silent on this day because there weren’t words to really say what her heart was feeling. And she could not tell the kind man with the tender eyes what those words meant to her on that day because she had never heard anything like them before. And at that moment she knew it was God’s way of acknowledging her and loving her as she rode the dusty roads of Uganda. And she traveled many more miles on that bus that day, and even more miles were journeyed in her heart, talking to Him. I know she will go the distance with Him. 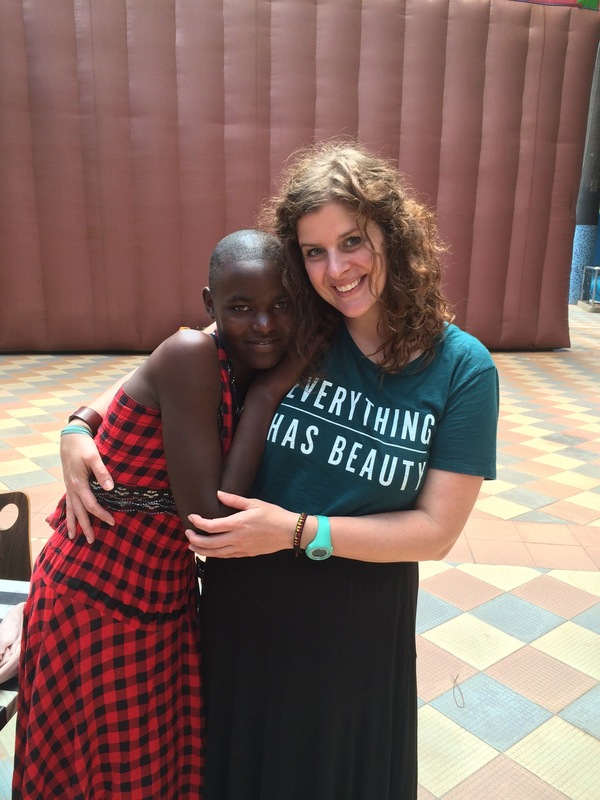 The young woman from west Texas was seen, and the teenager from the heart of Uganda was seen, and the little girl without a smile and a damaged eye was seen. As a matter of fact, so was I. “A rose could never lie, about the love it brings. And I could never promise to be any of those things. If I was not so weak. If I was not so cold. I didn’t meet Roberto in the usual way. I didn’t pick up his child packet at an event or see his picture on line. It wasn’t in the comfort of my home. It really wasn’t comfortable at all. There was nothing comfortable about how I came to know this little boy. 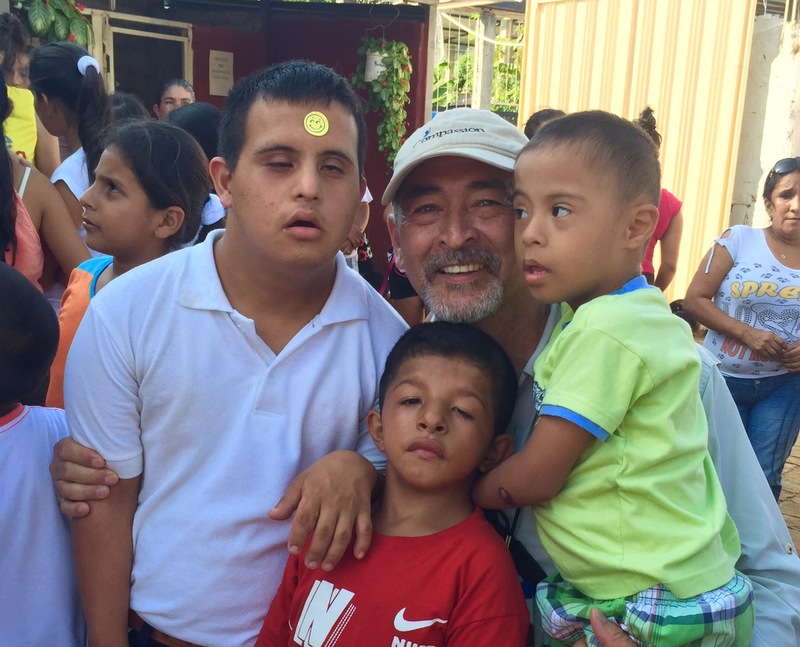 I had recently traveled to El Salvador for my job, which if you don’t know by now; is to take sponsors all over the world to meet their sponsored children. El Salvador was on my schedule four times in the year I met Roberto. At the time I was a little curious at the number of trips scheduled for this beautiful country tucked away in the heart of Central America. Looking back, I see the reason perfectly. It was on my second trip to El Salvador when I met him. Not really met him, introduced to him would be more accurate. El Salvador had come to be a destination that I loved to visit, for no other reason than the people. Good question. 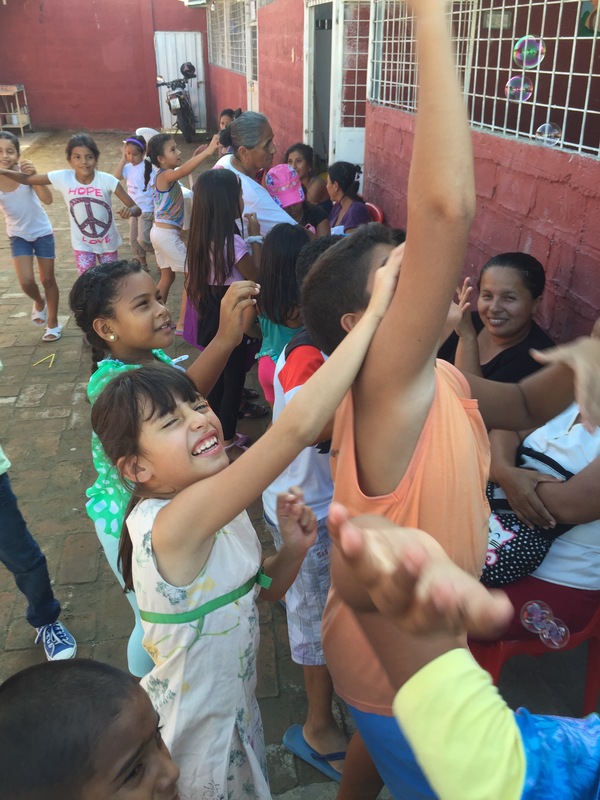 Why didn’t I sponsor a child in El Salvador? After all, I came here, more than any other country we worked in. And I may have been guilty of saying that El Salvador was my favorite. I get asked that question on every trip. At the risk of telling on myself, my response is the same when confronted with that question. My favorite country is always where I am currently. It’s not a copout! I really do try and stay in the present, and wherever I am at the moment is usually my favorite place to be. So the question was asked, the gauntlet was dropped and I began to seriously consider if another child was going to be sponsored in my household. My wife had told me on multiple occasions that if I ever met a child that I wanted to sponsor on a trip, to go ahead; I didn’t need her permission. That could become a very expensive proposition! I meet kids on every trip that I would love to sponsor. And I have only traveled to half of the countries that Compassion works in! So the seed was planted. The thought began to form. I leaned into lots of kids on that trip. Most of them had sponsors already. Occasionally I would meet one that I knew needed a sponsor and they would get scooped up into someone else’s loving arms. 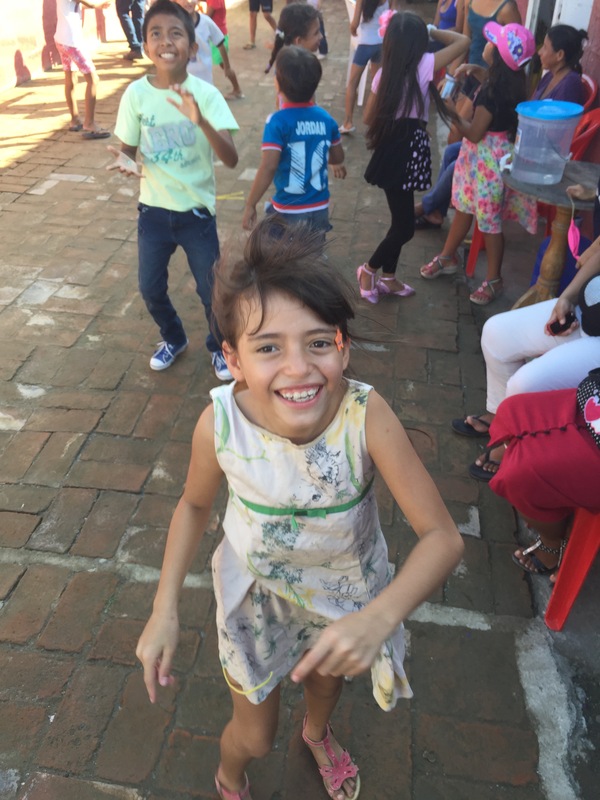 So I left El Salvador unscathed, no child had stolen my heart (well some did, they just didn’t need me to sponsor them) and just thought there would be another time to sponsor a child in El Salvador. One of the boys that got swept up by another sponsor. You may be asking, what about Roberto? Didn’t he steal your heart? Wasn’t he the point of this story? Yes he did steal my heart and yes he is the point. Only I didn’t realize it yet. 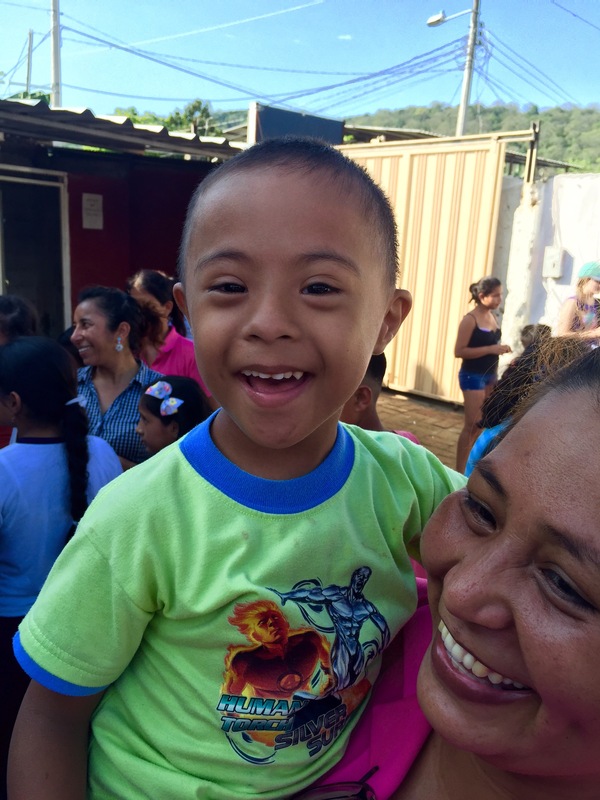 One of the days that we were in El Salvador, we visited the Compassion offices. It was here that the sponsors get a closer look at how all of the programs work, how everything fits together. And on this particular trip, the Country Director, Guillermo; showed a video that he was very proud of. It was a video clip of a little boy at one of the projects. 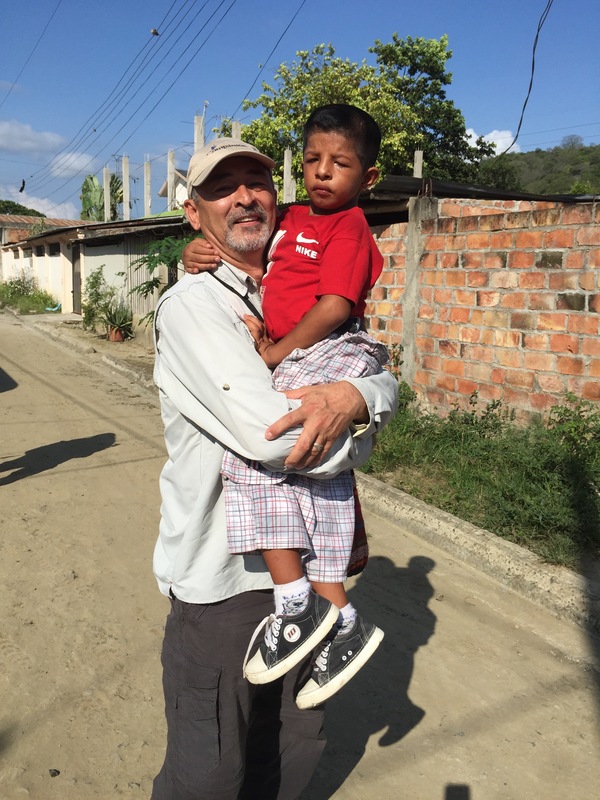 Guillermo gave us the backstory, how this little boy was on his way for treatment at the local clinic. How he had lashed out at the tutor that was escorting him to town, angry and gruff and probably very afraid at that moment. He took his anger and fear and confusion to the next level by biting the very hand that was trying to feed him. The tutor was bleeding badly and I’m sure she was a little angry and afraid and confused at this point too. She drove this little boy back to the church they had just left a few short moments before. I tried to picture the scene in my mind, put myself in her shoes. So glad that her reaction was not like mine might have been. I might have scared this little boy with an angry glare or harsh words. Having your finger bit to the point of drawing blood does not sound like something I would handle well. She took him to the office of the church and asked for some help. She may have still been angry, I don’t know. I’m certain that she was in pain. The pain that she was feeling at this very moment had less to do with her finger and so much more to do with her heart. I’m fairly certain of that, because this is where the video picks up. It’s grainy and it’s gritty. It’s just raw footage of a little boy in tears. It’s the type of tears that I remembered shedding when I was his age. They were tears of anger mostly. The crying of a little boy that knew he was in trouble and that was upset that he had to endure the face of authority again. “I do think God can come and change hearts” was his reply. “I just don’t think he is able to change mine”. And then the pastor of this little church in a little rural community in a little country in Central America, prayed a great big prayer. She first read to him from a letter that she wrote when she was his age and had accepted Jesus. And that moment came for Roberto. The moment when he walked into the arms of Jesus and stepped into eternity. The moment he said “I do” to Jesus’ proposal. And then to say that he wanted to say something to the tutor he had bit, to give her a heartfelt apology. And then to witness their embrace and the forgiveness and joy on the tutor’s face. Well needless to say, tears filled my eyes as I watched this transformation. That was all it took. I did not know that Roberto needed a sponsor, it was never mentioned. 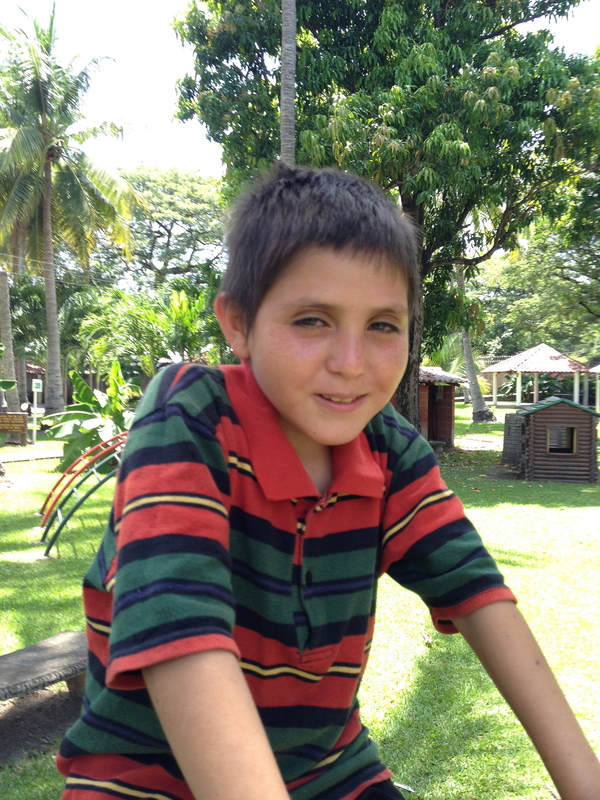 I made a phone call to see if I could get linked to this little boy that had stolen my heart briefly in El Salvador. Bad news! He is allocated to Canada and is out to an event. He may already be sponsored. Ten minutes later, I walked into Roberto’s story. I was scheduled to return to El Salvador the following month to join a church team. 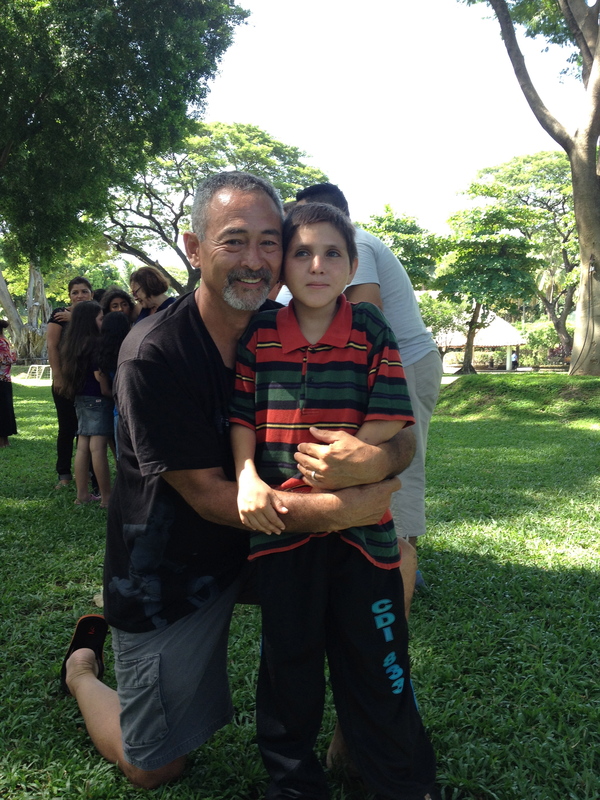 Here was an opportunity to meet Roberto face to face, an opportunity that was orchestrated by God a long time ago. A few weeks went by and we received a message that Roberto’s mom had passed away from cancer of the uterus. This was devastating news! Here was a little boy that was fighting for his own life, struggling to stay alive as he battled Type I diabetes. Having to give himself insulin injections every day, when he could even get them. Here was a boy that had been asked to be the man of the house because his father wouldn’t be. An alcoholic father that was gone most of the time, and now a mother that was gone forever. A young boy that needed help but had no one. No one but the tutors at the project and now a stranger a thousand miles away. What was I going to say to this little boy? What could I possibly bring that might ease the hurt, relieve the pain? My answer came from God a few days before I was to meet Roberto. I was in Guatemala on another sponsor tour. Roberto was weighing heavily on my heart the entire trip. My heart was not prepared to meet a little boy for the first time that was carrying so much grief, so much weight on his tiny frame. I found God and his answer in a tiny hut. It was on a hillside of a farming community in the mountains of Guatemala. It was a gorgeous day, bright and sunny; the walk to the house was a mile or so away. The surroundings were pleasant, serene. Tall pine trees lined the path and the scent of evergreen was everywhere. We stopped several times to take in the scenery. Vistas of green farmland were in view as far as we could see. The people here were poor and had very little material wealth, but they lived in an area that told me that God had not forgotten them. There were six of us on this home visit, eight with our translator and accompanying staff. The home was small but very neat. We commented to the mother on how clean everything was and how her pride in the home was so obvious. There were three boys and a girl. No father was evident in the home. He had been ordered to stay away by local authorities because of his abusive nature. We made small talk for a few minutes, asking her about her chores and how the children enjoyed the project. Someone handed one of the younger boys a Gatorade, and I will never forget how he made sure that all of his siblings got a drink. I couldn’t help but think how different that might have played out in so many homes in the US. I remember that I had switched groups for this visit. This was the first time I had done a home visit with this group of people. The switch wasn’t intentional or done with any thought. It was just a change that happened at the last moment. I also remember being slightly disengaged, almost uninterested in what was going on around me. I didn’t like feeling this way so I leaned in to the conversation. I took a mental note of how the younger brother shared his drink with baby sister and baby brother. How he offered some to his older brother and then shrugged his shoulders when big brother said no thanks. That’s when I noticed the older brother. I wish I could tell you his name, it is escaping me at the moment. I think it was Reynaldo or something like that. I am ashamed that I forgot his name but no one else seems to recall it now either. And perhaps Reynaldo’s name is not what is important for this story. Reynaldo’s story is important to this story. We were all in tears now, all of us fully leaning in to this “little man” of thirteen years, desperately trying to understand a desire like this. All of us knowing full well, the dangers of hitching a ride on “The Beast”. The last hope of so many young people, the train that would carry them across Central America and into Mexico, and finally with any luck to the United States. To bring them to a land that held so much promise, a land that would provide for every need. But deep down, we knew that promise was so fleeting. We knew that thousands of men and women, boys and girls had been cheated by this promise. We knew that thousands of lives were lost to the train simply known as “The Beast”. Lives were literally and figuratively crushed by the train called “The Beast”; and the enemy of our souls called “The Beast”. And my heart broke for Reynaldo. It broke because it wasn’t fair that a thirteen year old boy had to carry the weight of the world on his shoulders. It broke because he should be playing soccer or teasing pretty girls at school, not trying to figure out how he could get on a train and leave his family forever. And I leaned in to Reynaldo and I leaned in to God, and I heard that still small voice once again. And words came out of my mouth, and I so longed to be able to speak them directly to him. So I looked him in the eye and told him how proud I was of him, hoping that nothing would get lost in the translation. I told him that if I was his father I could not be prouder of him. Through tears I told him that he was good young man. Through tears I told him that God was very proud of him and loved him very much. And through tears I hugged him long and hard. And it was through tears that we took the long walk back that day. I pray for that little boy at times, that he never left his family and hitched a ride on “The Beast”. I pray that his family is intact and that dad would change and that Reynaldo will grow up to see the plans that God has for him. And on that long walk back that day I realized that God and Reynaldo had given me a gift. My heart was stretched again that sunny afternoon in a tin shack on the hillside of a little mountain community in Guatemala. I realized that my heart might have a response for a little thirteen year old boy that was carrying the weight of the world on his shoulders too. Only this little boy was not named Reynaldo, his name is Roberto. A few days went by before I met Roberto. I left Guatemala City and flew directly to San Salvador to meet the next group. I was emotionally spent, physically tired and mentally exhausted. I had to muster what I could for another little boy that needed me. I wasn’t sure what he needed from me, I just knew that he needed me. I will never forget meeting Roberto the first time, he was so frail and so fragile. I was afraid to hug him too tightly because he seemed like he would break. His eyes looked so sad, so old. His smile was as weak as his body was. I was looking at the face of a child that had seen so much devastation, a heart that had been broken over and over again. We had a few bites of pizza and had some small talk. I met his caregiver, Miguel, a staff worker from Roberto’s project. I thanked Miguel for taking care of Roberto. I wanted to give Miguel a sack of money to help with all of the needs. 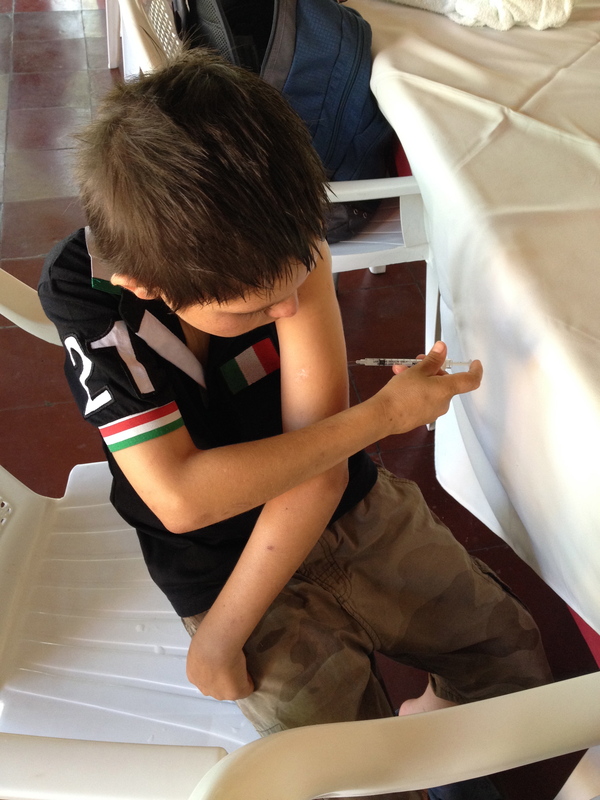 I watched silently as Roberto placed a syringe on his slender little arm, and gave himself an injection of insulin. Roberto administering his insulin shot. I told Roberto how sorry I was that he lost his mother. His reply still torments me, “These things are a part of life, there is nothing that can be done”, he said in a whisper. And then he said something that I will always cherish, “I knew when I first saw you, that I would love you.” And I hugged him tight and I held him for as long as I thought a little thirteen year old boy could bear it. Meeting Roberto for the first time with my good friend Fernando. I spent the entire next day with Roberto, swimming and laughing and helping him the best way I knew how; to feel like a kid. He made me smile as I watched him play. There was something so natural and pure about watching a boy play. Maybe for the first time in his young life. I couldn’t get him to come out of the pool. We were both shriveled and pruny and a little sunburned. I didn’t mind a bit. Seeing Roberto laugh and play made me feel like a kid again. And for just a moment I no longer saw him as frail and vulnerable, a condition that could cause him to be exploited and broken. He was still frail for sure, but now I saw that he could be nurtured and cherished. Oh, before I forget, I need to brag a little on Roberto. 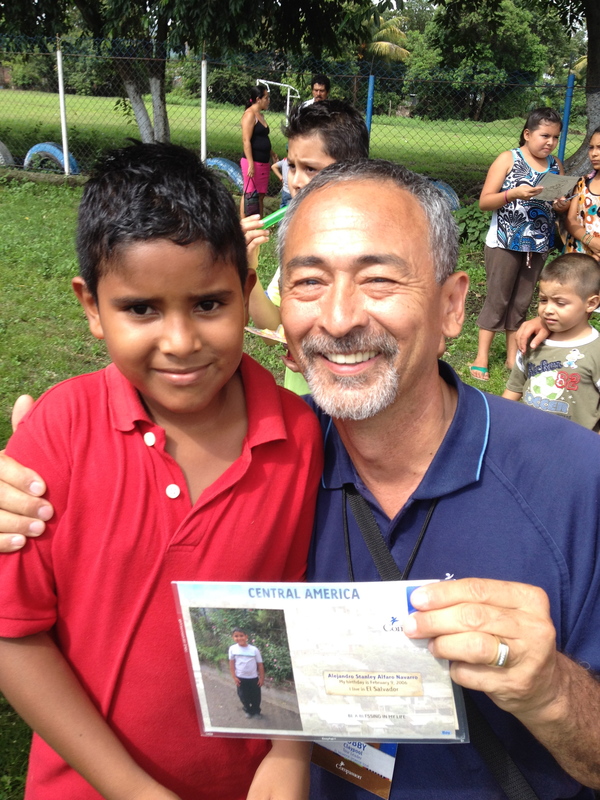 Guillermo, the Country Director in El Salvador shared another story with me about him. The office staff had “adopted” Roberto and had taken up a collection to buy him birthday gifts. Some of the folks in the office heard about it after the gifts had been purchased, and insisted that they be allowed to give something. So a small amount of cash became part of Roberto’s birthday present. The first thing Roberto wanted to know was how much was the tithe on this gift. He wanted to give back to God. And now Roberto is giving to me. I can’t thank him enough for stretching my heart and loving me the way he does. His little body may be frail, but his heart is the farthest thing from it! Smiling after a long day of swimming.